Hemodialysis cleans the blood in a treatment that is performed outside of your body. In this treatment your blood is circulated through a filter (dialyser) connected to a dialysis machine. Each treatment usually takes 4-5 hours and it has to be performed at least three times a week. 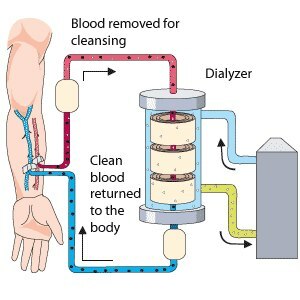 How your dialysis session Works? Before you begin your hemodialysis, you need to have a vascular access in place. At the start of each session you will need to have a small procedure to prepare the vascular access for connection to the blood circuit. During the entire dialysis session you will sit or lie comfortably on a chair or a bed, you will be able to read, listen to music or sleep. You may also use your mobile phone to make necessary calls or your computer to work, watch movies or access the internet. Hemodialysis is not painful as such. You are, however, likely to experience some side effects. It is quite common to feel tired after a long dialysis session. A way to cope with this symptom is to adjust your diet and to exercise regularly. This might boost your energy levels. Some people may experience nausea, feel dizzy or have muscle cramps during the dialysis. If you have these problems, your medical team will do everything to help you cope with them.